MEDC DB16 Speaker (up to 30 Watts), Zone 1, Zone 2 use & non-Ex use. Exde, Weatherproof, IP66 and IP67, intended for use in potentially explosive gasand dust atmospheres. -50C to +65C. ATEX approved, Ex II 2GD, EExde IIC T110�C. GOST K IIC and Inmetro IIC also available. 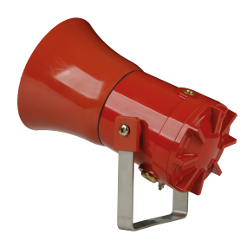 This range of loudspeakers, intended for use in potentially explosive gas and dust atmospheres, has a power rating of up to 30 Watts and is suitable for use in the harsh environmental conditions found offshore and onshore in the oil, gas and petrochemical industries. With an integral increased safety chamber, for termination, this unit offers both high output and easy installation. In addition, the 25 Watt version still offers superior output with a higher ambient certified temperature (+65�C). ATEX approved, Ex II 2G/Ex II 2GD*. Certified temperature: �50�C to +65�C*. Up to 122dBA at 30 Watts at 1 metre*. 25 and 30 Watt versions. Certification CENELEC EN50014, 18, 19. 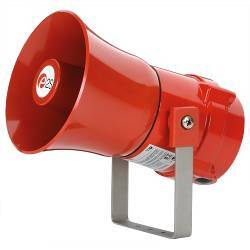 � Ordinary locations: Signalling Speaker. GOST �K� Certification: Exde IIC T4/IIB T3. Brazilian (Inmetro) Certification: BR-Ex de IIB T3. 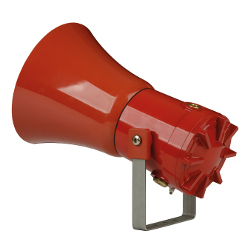 Material Body & horn in anti-static, UV stable, glass reinforced polyester. Mounting stirrup and fixtures in stainless steel. Finish: All natural or body and horn can be painted to client requirements. Rated Power: 30 Watts RMS continuous (at 25�C). Certified Temp: -50�C to +40�C (30W version) -50�C to +65�C (25W version). Ingress Protection: IP66 & IP67. Terminals: Up to 8 x 2.5mm2. Frequency Range: 370Hz to 8kHz. Mounting: Via stirrup with ratchet facility. Earth Continuity: Available via optional earthing stud or by internal earth plate. Labels: Optional stainless steel tag and duty labels. > ATEX EEXDE > SPEAKERS : 29 Items found. 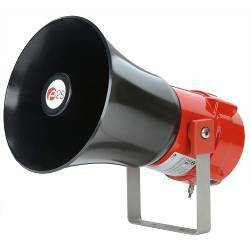 E2S ML15 15W PA Horn Loudspeaker 118dB(A). Robust, fire retardant, IP66 & IP67 housing. Stainless Steel fixings. 100V Line, 70V Line, 16 Ohm or 8 Ohm Versions. GOST-R Approved. 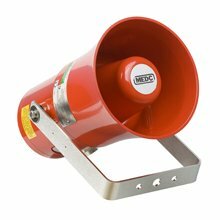 E2S ML25 25W PA Horn Loudspeaker 121dB(A). Robust, fire retardant, IP66 & IP67 housing. Stainless Steel fixings. 100V Line, 70V Line, 16 Ohm or 8 Ohm Versions. GOST-R Approved. 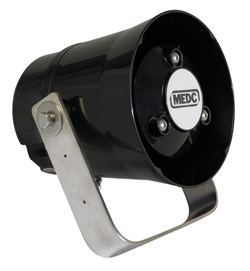 MEDC DB14 Speaker (up to 15 Watts), Harsh Industrial & Marine Environments. IP66 and IP67, manufactured from a UV stable glass reinforcedpolyester. MEDC DB18 Speaker (up to 15 Watts), Ex nA, Weatherproof. Zone 2 use. IP66 and IP67. Available certifications: ATEX and BASEEFA. E2S BExL15D flameproof PA 15W Loudspeaker. LM6 aluminium enclosure. Suitable for Zone 1 & Zone 2 applications. Two M20 cable entries. IP66/67. ATEX, IECEx, GOST-R (1ExdIICT4), SIL1 and Inmetro Approved. MEDC DB10 Speaker (up to 15 Watts), Exde, Weatherproof. Zone 1, Zone 2 and non-Ex use. IP66 and IP67, intended for use in potentially explosive gas atmospheres. Available certifications: ATEX, BASEEFA, IECEx, GOST 'R' and 'K', CQST and Inmetro. 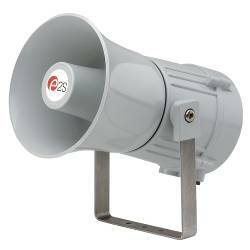 E2S BExL25D flameproof PA 25W Loudspeaker. LM6 aluminium enclosure. Suitable for Zone 1 & Zone 2 applications. Two M20 cable entries. IP66/67. ATEX, IECEx, GOST-R (1ExdIICT4), SIL1 and Inmetro Approved. E2S BExDL15D flameproof PA 15W Loudspeaker. LM6 aluminium enclosure. Suitable for Zone 1, 2, 21 & 22 applications. Two M20 cable entries. IP66/67. ATEX, IECEx, GOST-R (1ExdIICT4), SIL1 and Inmetro Approved. 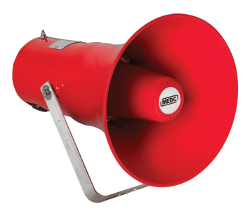 E2S D1xL1F 15W PA Loudspeaker with re-entrant flare horn. High SPL. Type 4/4x, IP66 aluminium enclosure. Suitable for all Class I & II Division 1, Zone 1 & 20 applications. UL and CSA Approved. 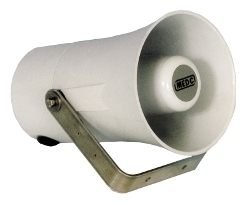 MEDC DB20 Speaker (up to 8 Watts), Weatherproof only version. Zone 1 and Zone 2 use. IP66 and IP67. 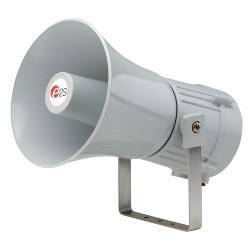 E2S E2xL15 15W PA Loudspeaker 118dB(A) suitable for the harshest of environments. PPS & high impact housing. 100V Line, 70V Line, 16 Ohm or 8 Ohm Versions. UL Approved for Class 1 Div 2. 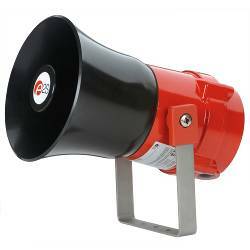 E2S BExDL25D flameproof PA 25W Loudspeaker. LM6 aluminium enclosure. Suitable for Zone 1, 2, 21 & 22 applications. Two M20 cable entries. IP66/67. ATEX, IECEx, GOST-R (1ExdIICT4), SIL1 and Inmetro Approved. 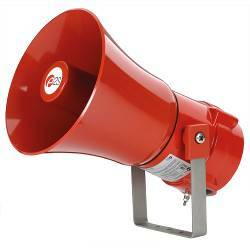 E2S D1xL2F 25W PA Loudspeaker with re-entrant flare horn. High SPL. Type 4/4x, IP66 aluminium enclosure. Suitable for all Class I & II Division 1, Zone 1 & 20 applications. UL and CSA Approved. 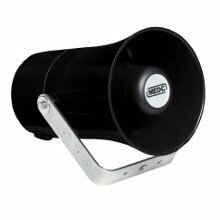 MEDC DB20 Speaker (up to 8 Watts), Exde, Weatherproof. Zone 1 and Zone 2 use. IP66 and IP67. Atex approved, Ex II 2 GD, Ex de IIC T4/T5, Ex tD A21 T100�C/T115�C/T130�C. CUTR, IECEx and Inmetro certifications also available. 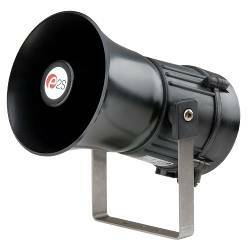 MEDC DB20 Speaker (up to 8 Watts), Exde, Weatherproof. Zone 1 and Zone 2 use. IP66 and IP67. Atex approved, Ex II 2G, Ex de IIB T3/T4. CUTR, IECEx and Inmetro certifications also available. 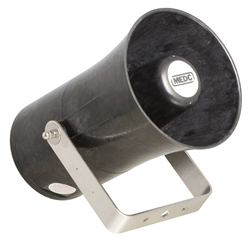 MEDC DB4 Speaker (up to 25 Watts), Weatherproof only. IP66 and IP67, intended for use in potentially explosive gas and dust atmospheres. E2S BExL15E flameproof PA 15W Loudspeaker. LM6 aluminium enclosure. Suitable for Zone 1 & Zone 2 applications. Two M20 cable entries. IP66. ATEX, IECEx, GOST-R (2ExdeIICT4), SIL1 and Inmetro Approved. E2S BExL25E flameproof PA 25W Loudspeaker. LM6 aluminium enclosure. Suitable for Zone 1 & Zone 2 applications. Two M20 cable entries. IP66. ATEX, IECEx, GOST-R (2ExdeIICT4), SIL1 and Inmetro Approved. MEDC DB4 Speaker (up to 25 Watts), Exd(e), Weatherproof. Class I Div 2. IP66 and IP67, intended for use in potentially explosive gas and dust atmospheres. ATEX Certified, Ex II 2 GD, Ex d IIC T4/T5 Gb, Ex tb IIIC T100�C/T135�C Db. 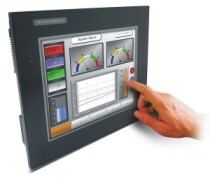 IECEx, Inmetro and CUTR certifications also available.